Since President Abraham Lincoln declared Thanksgiving a national holiday in 1863, turkey has gained traction throughout the last two centuries as the most popular meal for the annual Thanksgiving Day feast. And, that day is right around the corner. For those who are responsible for the turkey, you have around 48-hours to get the food list finalized, bought, prepped, and prepared for this Thursday! This year are you looking to impress your guests with a different way to cook the turkey, but not sure what all your options are? Should you go the traditional route and roast in the oven? Or maybe do a slow roast with all the vegetables and stuffing in a cooker? What about a smoked turkey? Deep fried? How to choose?! We’ve prepared a list of our favorite five ways to cook a turkey. So be adventurous, try something new this Thanksgiving. First things first, if you own a smoker grill than you know how tender and juicy the meat can come out. Rest assured that your smoked Thanksgiving Day turkey will be no different. It will have that one-of-a-kind smoked smell and flavor, accompanied by juicy and tender meat that falls right off the bone. When smoking a turkey, it’s good to plan 30 minutes per pound, with a cooking temp around 240-250 degrees. Remember to baste your smoked turkey every 1-2 hours to ensure a good smoked char coats the skin. 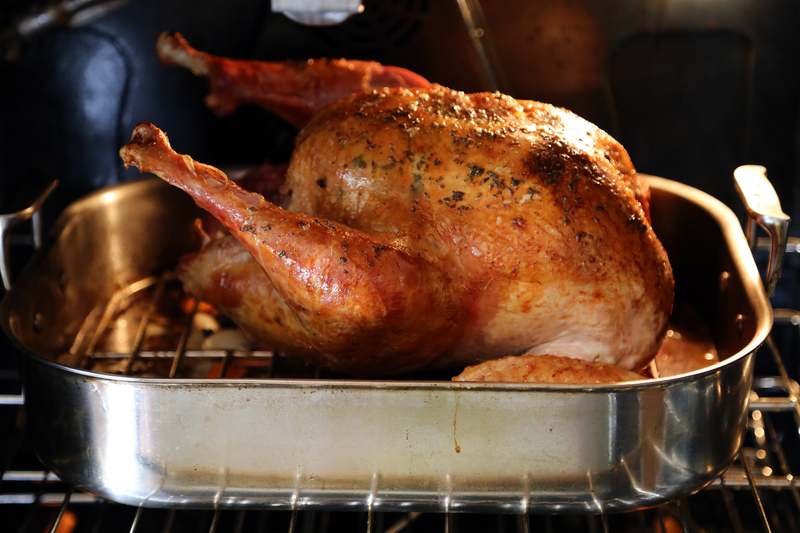 If you’re a fan of dark meat, smoking your turkey may be the right move for you. If you aren’t the host this season, but still required to bring the main meal, an electric roaster over is a great option. Make sure to look up a few different ways this can be done, but we’d recommended not to add water in the roaster oven, as it will create steam and may steam-burn the turkey. But we do suggest cutting up some potatoes, grabbing some vegetables such as carrots, celery and onions to line the bottom. When the turkey is done, and the internal meat measures a minimum of 180 degrees, your roaster oven cooked turkey should be very moist and juicy, but less brown than a traditional oven roasted turkey. Don’t let the color fool you, use the temperature gauge to confirm the meat is fully cooked. If you have a deep fryer, we’re going to assume you know how to properly set it up and use it. Before you decide to deep fry a turkey, PLEASE make sure your turkey is completely thawed out. We don’t need to talk about all the horror stories of what can happen if it’s still frozen (if you don’t know what happens when trying to deep fry a frozen turkey, just Google it). But to get back on track, we suggest using Peanut Oil to fry your turkey. It will add more flavor than other cooking oils. You’ll want to heat your stockpot or fryer to 350 degrees before lowering the turkey CAREFULLY into the pot without splashing burning oil everywhere. Make sure it’s completely submerged in the oil. Then, allow 3-4 minutes per pound of your turkey to be fully cooked. So, a 15 lb. turkey should take just under an hour to fully cook. Make sure to check the internal temperature of the bird to ensure it’s fully cooked. You may be good on the grill, but are you a true grill master? Maybe this is the year your skills are put to the test and shoot for a nicely charred turkey this Thanksgiving. There are a few primary ways to do this, some suggest cutting the bird down the back and placing it on the grill breast up, while others prefer to leave it whole and turn it throughout the cooking process. The grill can bring out some amazing flavors in a turkey, but also poses a threat of over cooking and over charring the skin. If you have any doubt in your grilling skills, have a backup plan or put another turkey in the oven for those who like a more soft and tender cooked meat. Our final option is all about tradition. Many still are accustomed to the oven-baked turkey. This may be the old school way, but we think we’ve saved the best for last! Start by getting an oven safe pan, butter up and season your bird exactly how you want it, then stick that plump birdy in the oven. Depending on the level of brown you want for the skin, we suggest making an aluminum foil tent to enclose the turkey in the pan. Taking this approach also makes the turkey cook faster by locking in heat from the turkey. Once it hits 180 degrees and is fully cooked to your liking, you can take off the aluminum foil for the last 30 minutes to allow the skin to darken..
All turkey cooking options within this post can be dangerous if not executed properly. Please make sure that you carefully read all instructions prior to using any equipment and find multiple resources for recipes and ways to cook your meal. We want you and your family to be safe on Thanksgiving – Please stay alert when cooking. Regardless of which way you select to cook your Thanksgiving Day feast this year, at Offerpad we wish you and your family an amazing day filled with friends, family and gratitude.